The Kuklapolitan Courier's "Story of the Kuklapolitans"
nderstanding the beginning of the Kuklapolitan Players means going back to a Chicago kindergarten a quarter of a century ago. A little boy pounced on two teddy bears, waggled their arms and heads, and made them become alive in his own mind and in the minds of his playmates. Burr Tillstrom was the little boy. The imagination which delighted the kindergarten playmates is today entertaining millions of people nightly in every part of the country. 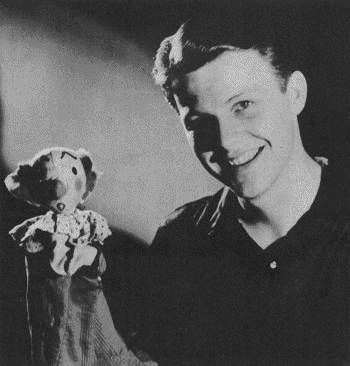 After his discovery of the teddy bears, Burr Tillstrom devoted most of his school days putting on puppet shows with stages made of orange orates and old lace curtains donated by his mother. His first professional venture came in a garden on Chicago's North Side. Mrs. Charlotte Polak, sister of Tony Sarg, moved into Burr's block. It wasn't long before they were producing a puppet show in Mrs. Polak's garden. "It was a financial and artistic success," the young producer reported. "We filled the yard at 10 cents a head." Burr worked in dramatic societies at Chicago's Senn High School under Melita Skillen, who sent a number of students on to stage fame from her high school dramatics classes. Burr's theatrical career was interrupted while he attended the University of Chicago on a scholarship he won for good grades. 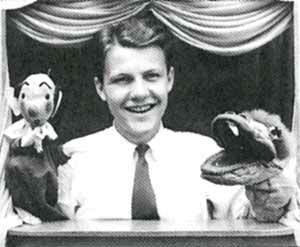 He was back with puppets within a year, working as a puppeteer in a WPA entertainment unit. "I earned $21.25 a week, and it looked like more to me than any money has ever since," Burr relates. Burr received a liberal education in showmanship in the following months as he gave literally thousands of marionette shows. He set up at beaches, YWCA's, parks, carnivals, churches, the Art Institute in Chicago, clubs, field houses, hospitals, orphan homes, old people's homes, restaurants, and schools. The partnership of Burr Tillstrom and Kukla was made in 1936. A friend had asked Burr to make him a puppet. Burr did so, and had the little fellow in a box ready for shipment to the friend. "But I looked at him there and said to my mother, 'I can't send him away. He's too cute.'" 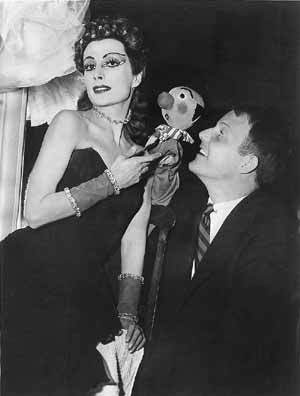 So he made a new puppet for the friend, and Kukla became the first member of what was to grow into the famed Kuklapolitan Troupe. Kukla - then nameless - went everywhere with Burr. He sometimes peeked from behind a curtain at a WPA show, heckling the master of ceremonies. He performed at parties and in restaurants, in friends' homes. He was peeking into the dressing room at the ballerina Toumanova when the dancer looked around and exclaimed, "Ah, Kukla!" Thus the Russian word for "doll" became Kukla's name. Mme. Ooglepuss was the second member of the Kuklapolitan Troupe. She joined in 1937. Ollie appeared in 1938, because all well-rounded theatrical troupes should have not only a prima donna, but also a dragon. Cecil Bill, then called Bill, and Mercedes joined in 1942. Buelah Witch and Fletcher Rabbit had humble beginnings in a show prepared for the Junior League in 1945. It was "Hansel and Gretel," and the casting called for "A Witch" and "A Rabbit." That was the original billing for this pair. They did such sensational work in their comparatively minor roles that they remained as permanent members of the Troupe. Burr and the Troupe did their first television work in 1939 when they staged shows over a closed circuit in the Marshall Field store for RCA Victor, which still is one of their sponsors 12 years later. His first experience with television convinced Burr that here was the perfect medium for the art of the Kuklapolitan Troupe, and he never lost sight of that objective. In the spring of 1940 RCA sent Burr and the Troupe to Bermuda to do ship-to-shore telecasts - the first television show from midocean. Their next stop was the New York World's Fair, again for RCA. The Troupe spent the following years filling every type of engagement, building a repertoire and learning the teamwork that was to contribute so much to their success in television. They had done work at television station WBKB in Chicago as early as 1942. Early in October, 1947, Burr received a call from Capt. Bill Eddy, head of WBKB. "How would you like to do a regular TV show?" Capt. Eddy asked. Burr didn't even ask who the sponsor was to be. When he got to the station, he discovered it was to be the Troupe's old friend, RCA Victor. The program was to be one hour long, five days a week, and was called "Junior Jamboree." 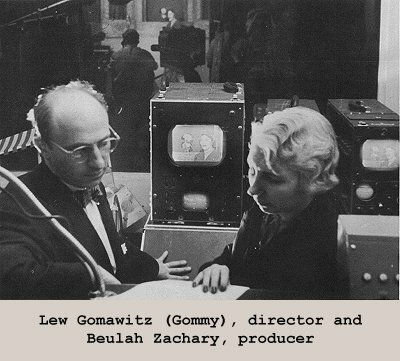 Beulah Zachary was the producer, and Lewis Gomavitz was director, just as they are today. Both were television veterans, even at that early age of TV. They had been on the staff at WBKB since the early 40's, and were pioneers in the new field. Both were long-time friends of Burr, and Beulah and Burr had been working on plans for a show even before the call came from Capt. Eddy. Joe Lockwood, who was earning his reputation as an interior designer, had been helping Burr backstage in shows at Field's and other places. He came along with Burr to WBKB, to design costumes and scenery and to help backstage, just as he does today. It was decided that a pretty girl was needed for the TV show. Gommy suggested Fran Allison. Burr and Fran had worked together a couple or times, once on a bond selling show on Michigan boulevard. Burr called Fran. Fran had come from LaPorte City, Iowa. She studied music and education at Coe College, in Cedar Rapids, spent four years teaching in a rural school, and sang on a Waterloo, Iowa, radio station. She headed for Chicago and network fame in 1937. She had singing and dramatic roles on network radio shows, and was a regular on the Don McNeill Breakfast Club, where she became famous for her "Aunt Fanny" character. She was married in 1941 to Archie Levington, representative of a music publishing company. "Fran went on cold for the first show. She knew little about Kukla and Ollie and the other players, but she fell in love with them, and they with her. She said that this was what she had always waited for. She helped build the characters by her understanding and warmth. I played to her and she played to me. We both go back to when we were kids and play acted. You remember, 'Let's pretend. I'll be king and you be my queen.' Fran has a very rare talent, and becomes more wondrous to me as we work together." 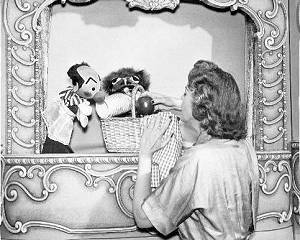 "Junior Jamboree" was changed to "Kukla, Fran and Ollie" several months after the show had been on the air. The hour-long show continued for nearly a year. Kukla and Ollie often had guests. They had movies and cartoons, created their first pageants, and read the names of children who had birthdays, until the list got so long they would have done little else the whole hour. During this year Col. Crackie came up from the Deep Sooth to join the Troupe and take over the introductions to pageants, and Miss Clara Coo Coo made the first of her trips from the North Pole to visit Ollie. (She's official timekeeper in the North Pole area). Mercedes dropped in one day and never left. Cities in the Midwest were connected by coaxial cable in the fall of 1948, and Kukla, Fran and Ollie went on the Midwest NBC network Nov. 29, 1948. Early in 1949 the coaxial cable linking the big cities east of the Mississippi was opened, and the Kuklapolitans were on the NBC network from the day that the cable went into regular use. All this time RCA Victor had been their sponsor. When they went onto the full network, Sealtest ice cream became the sponsor on Tuesdays and Thursdays. Shortly afterward Ford Motor Company took over the Wednesday shows. This sponsorship continued until early in 1951, when Life magazine and Procter & Gamble assumed sponsorship of three programs a week, replacing Sealtest, so the lineup became Procter & Gamble with two shows a week, and RCA Victor, Ford and Life with one each. One of the most amazing aspects of the Kuklapolitan Troupe in this age of huge organizations, of artists incorporating themselves, and having huge stables of writers, publicity men, promoters, secretaries, arrangers, and directors, is the simplicity of the Kukla, Fran and Ollie organization. Beulah Zachary is still producer. She helps with ideas, planning, and overall management of the organization. Lew Gomavitz, or Gommy, is in the control room as director everyday, just as he was the day the show went on the air. He directs the camera operators and sound men, sees that the show gets on and off the air on time, and makes sure the commercials get in the show. He also knows every nook and cranny in Chicago where good props may be bought. Joe Lockwood has helped Burr backstage since the start of the TV shows, and is responsible for some of the superb costumes worn by the cast, particularly by Mme. Ooglepuss and Buelah Witch, and by Ollie in the historical pageants and holiday celebrations. Jack Fascinato joined early in 1948, immediately after the ban against live music in television was lifted. In the three years since then, Jack has written more than 55 original songs for the show, and a countless number of musical arrangements. 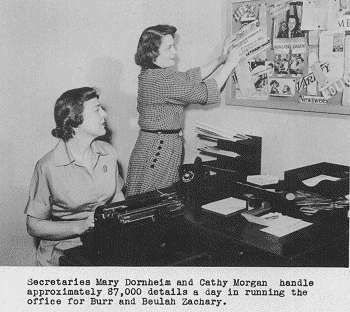 Secretaries Mary Dornheim and Cathy Morgan handle the correspondence (after Fletcher has organized it, of course). This can mount into a sizable job. Once last year Box 3446 received more than 10,000 letters in a single day. These 10,000 letters, incidentally, were requests for the Kuklapolitan Courier, and will help you understand why the Courier is coming to you in this form this year, instead of in five or six issues each year. The Courier was started by Burr Tillstrom exactly a year after the show went on the air, as a small newspaper about the activities of the Kuklapolitans. Subscriptions were sent to anyone who wrote in. The circulation rose from 6,000 to more than 200,000 in less than two years. The yearbook was started when the Courier circulation passed 200,000. Kukla, Fran and Ollie have never had rehearsals and have never done a show with a script. Burr, Fran, Beulah, and Jack sit down together once a week or so to plan programs so that arrangements may be made for songs, and props and costumes may be obtained in advance. Burr, Fran and Jack run through the songs in advance together for timing and to make sure everyone picks the same key. The dialogue is never rehearsed, and even if Burr does have an idea of what is going to be said on the show, the chances are good that Kukla and Ollie will take things into their own hands. And that's the story of Burr and Fran and the Kuklapolitans.